Bowing in Korea and other punishments – Hello Korea ! Um, I STILL don’t know how to do this and probably never will. If people bow to me, I usually do a little head-nod, smile, and stick out my hand for a shake. Most bowing I experience is in passing. The students shuffle past, (and humorously speed up out of nervousness) and then jack-knife their head into a quick and violent little head-nod bow. Lately, I’ve been seeing the full-on most formal bow A LOT. As a punishment, two of the teachers in my office make their students bow to them formally. From a standing position, they must then get on their knees, put their hands together over their heads, and then bend over ’til their forehead and outspread arms touch the ground. On a formal occasion this is done slowly and reverently but as a punishment, because the students may have fifty of these to do, they try to get it over with as soon as possible. It must be hugely aerobic, going from standing to almost prone, as they are really laboring in a short while. It’s really hard to watch/hear, as even though they put a book on the floor to soften the blow, I can hear the impact of their knees on the ground each time, and I’m sure their poor knees are black and blue by the time punishment is over. The home-room teacher for the Architecture students has them do knee bends. From my desk, I am always seeing student heads bobbing up and down. It’s not severe enough, I guess, because there are always a lot of them, and it’s seen as more of an interesting challenge, as you can see them laughing with determination as they bob as fast as they can. My co-teacher has the students line up on their knees and then she she chews them out. And every day there is one student or another being lectured endlessly until they cry. Parents are always being called in as well. Nothing like making mom have to come to the school, because the wrath of one’s mother is probably the worst punishment of all. The biggest problem in this particular school is smoking. I can’t figure out why they are stupid enough to smoke in the bathroom repeatedly, when there are other places they could go to which would be less obvious, but they do. As one of the punishments, the offender must stand outside of the bathroom during breaks and lunch-time with a sign warning the other students of the consequences of smoking. I’d asked one of the students why they are standing there, holding that sign, and he said, “tambay.” I looked at the sign, and suddenly I realized I’d been spelling cigarette wrong. It’s spelled: 담배 (dambae) and NOT 탐배 (tambae) but they say many of their ㄷ (d) with a “t” sound. The ㅌ(t) is rarely used, and it has a higher pitch that escapes my foreign ear, while ㄷ sounds somewhere between the “d” and “t” sounds. It’s a phonetic alphabet, but these distinctions make it sometimes hard for the foreigner to spell or pronounce things correctly. 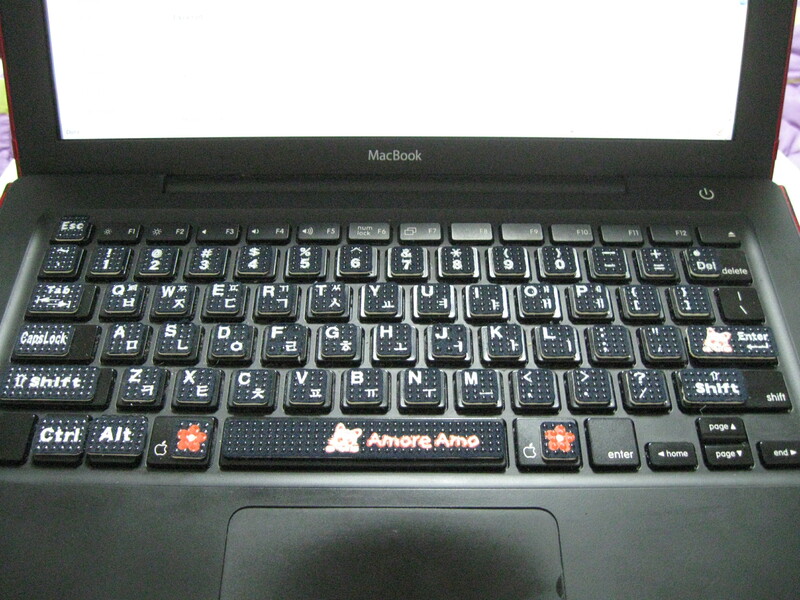 There are actually several different keyboard layouts, but this 2-set is the most common one. Cell phones (Koreans say “handuh pone-uh” because that’s the closest hand phone can be spelled phonetically in Korean) also have different keyboard layouts, depending on the make and model. The alphabet consists only of lines and circles, so one keyboard makes you build the vowels and another keyboard has them already built. And somehow, somehow the keyboards know just when to stack the letters so the syllable blocks come out perfectly. It’s tricky on my cell phone, because you have to enter in the text QUICKLY or sometimes it won’t build the syllables correctly. And I write Korean as fast as I read Korean, which is still at illiterate pace. Fortunately, most Koreans I deal with can read English, even though they can’t speak it. The other day I went to the new Lotte Marte in Chuncheon and arrived before it was open. They let a couple of us in early and gave us a cup of tea, and I got to enjoy watching the check-out girls do their morning calisthenics! (just like in the “Gung Ho” movie!) With happy music playing in the background, a worker lead the workers through some exercises over the store PA, and then they all had them turn to a partner and practice greetings and bowing to the customers. They were all cracking up by the end of the exercise, and it was a great way to start a long day of customer service. OK! No 머리 for me ever again! bleckkk! Wearing jewelry the colour of the charka you are healing will also help. in the year 2013. inspiration, creativity and intuition within the mind.